THE MEMOIRS OF HECTOR BERLIOZ. HECTOR BERLIOZ’S Mémoires are a classic of musical autobiography. If not absolutely “everyone” has read it, everyone at all acquainted with musical literature must be familiar with some of its stories: Berlioz’s attempt to return to Paris from Italy in feminine disguise in order to kill his faithless fiancée, her mother, and his rival; his audible bids for “ideas” during a performance of Cherubini’s Ali Baba; the conductor Habeneck taking snuff at a crucial point in Berlioz’s Requiem in order to wreck the performance; the hoax in which the composer pretended that the shepherds’ chorus in L’Enfance du Christ was the work of Pierre Ducré, an imaginary eighteenth-century choirmaster; the symphony that was never written because the cost of performing it would have been ruinous. Anyone—musician or not—who has never read the book as a whole has missed a masterpiece, comparable in its scope and approach with Goethe’s Dichtung und Wahrheit, in the gusto of its writing with Dickens. Truth is imaginatively intensified; everything is larger than life and characters become caricatures, though acid irony takes the place of Dickens’s facetious humor. And if Dickens was justly celebrated for his power over the reader’s tear-ducts, no sensitive person can read without being deeply moved Berlioz’s accounts of his return to his dead father’s house and his visit in old age to the sweetheart of his childhood. He is writing, of course, of the first performance of his own “Hungarian March,” the autograph score of which he presented to the city of Pesth (not yet Budapest), where it may be seen in the Széchényi National Library. The value of these melodies, their distinction, originality, and charm, may well be contested; it is not for me to estimate it. But to deny their existence is, I submit, dishonest or simply silly. Only, as they are very often on a very large scale, a shallow, undeveloped sensibility is slow to grasp their form. They may also be combined with other subsidiary melodies which, for these same weak spirits, obscure their outline. Finally, such melodies are so unlike the desperately trivial little tunes which the riff-raff of the musical world understands by the term, that it cannot bring itself to admit that they are tunes at all. Chopin chafed under the restraints of time, and to my mind pushed rhythmic freedom much too far. Ernst can take liberties with the beat when artistic reasons ... demand it, but he is essentially a rhythmical player; there is steadiness at the heart of his most daring fancies. Chopin simply could not play in strict time; Ernst is capable of abandoning strict time, but only so that the underlying pulse may be felt all the more strongly when he returns to it. Berlioz admired Mendelssohn extravagantly, and was cruelly hurt when he learned in 1864, upon the publication of Mendelssohn’s Reisebriefe, that the feeling had been anything but reciprocated. Berlioz is wrong, however, when he says that Mendelssohn had not seen the score of the Fantastic Symphony in 1831; the full text of Mendelssohn’s letter of March 15—which has apparently escaped David Cairns’s notice— gives abundant proof that he had. The Mémoires are as characteristic of their author as any of his compositions and, as someone has said, much more French; they are in fact so French that they almost defy translation into idiomatic English. Up to the present, English readers have known them mainly through Ernest Newman’s adaptation (which was actually suggested by the American publisher of the present version, Alfred Knopf) of the Victorian translation published by the Holmes sisters eighty-five years ago. Now comes one of the leading younger British Berliozians with a fresh version, which he has “tried to make as English as possible while stopping short of the absurdity of pretending that it is an English book.” And, with the exception of a few words or phrases like “for the umpteenth time” or “my phobia of organ gigues,” which strike the wrong note not because they are English but because they are twentieth-century, he has succeeded—as the foregoing quotations show. Yet it is not so much on account of his translation that Cairns supersedes Holmes-Newman as by his knowledge of recent Berlioz studies. His reconstructions of the chronology of “dark periods” in the composer’s early life are most valuable, and his love of the master’s work has not blinded him to that “proneness of artists to write for effect,” to which Berlioz frankly and amusingly confessed. Newman was not credulous, but sometimes he was too incredulous; he thought it “more than doubtful,” for instance, that the snuff-taking incident ever took place. Cairns discusses the pros and cons at length in his admirable appendix of “Errors, Disputed Points, and Other Matters,” and concludes that it probably did. Newman was skeptical about the famous canard that when Paganini gave Berlioz 20,000 francs he was merely acting as the agent of the publisher Armand Bertin, and Cairns’s labors to prove its untruth are unnecessary. Documentary evidence of its falsity was published twelve years ago by Geraldine de Courcy in her Paganini the Genoese. * The late Gerald Abraham (1904-1988) was a distinguished British musicologist. 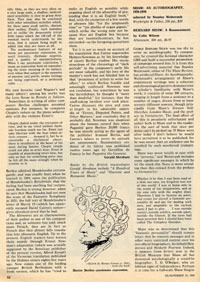 His article has been scanned from a contemporary copy of the Saturday Review [originally Saturday Review of Literature], 15 November 1969 in our own collection. We have preserved the author’s original spelling, punctuation, and syntax. 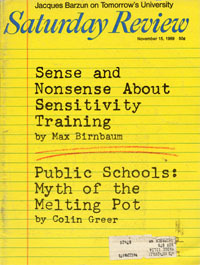 We have not been able to contact the descendents of the author or the editor of the Saturday Review, which has ceased publication.